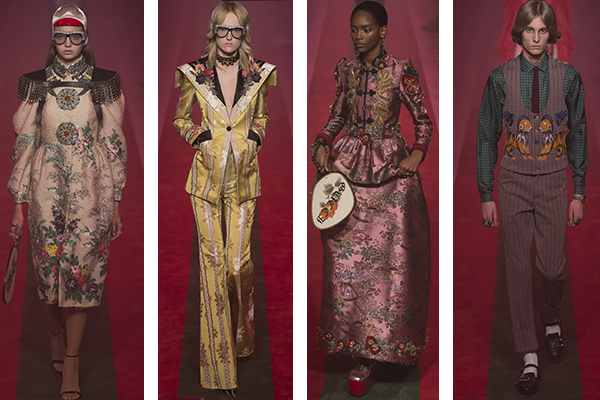 When you quickly glance at Gucci’s Spring collection, you catch glimpses of different points in history while all making sense. 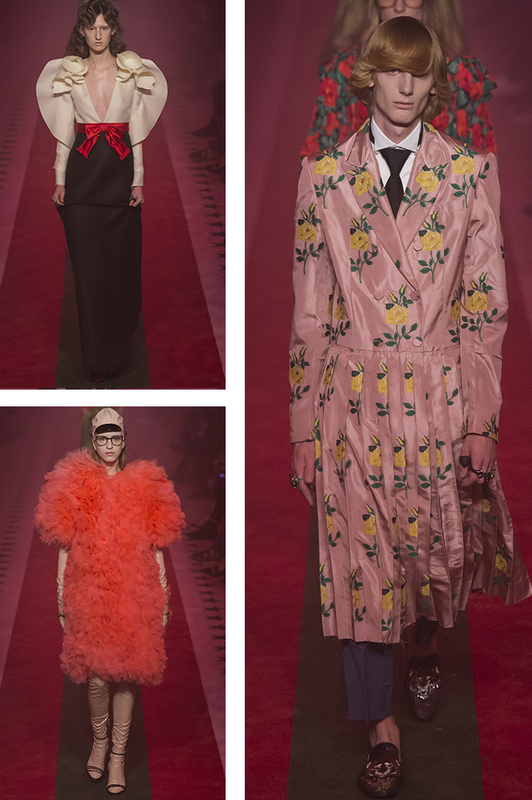 With excess being synonymous with glamour, especially that of the Seventies, Gucci managed to feature a lot of the obvious kind but then drop subversive hints of other which included something as sweet as embroidered roses on a man’s double-breasted coat or a salmon pink tulle ruffled coat paired with a patent leather aviator’s cap, patent leather opera gloves + patent leather thigh high platform boots. 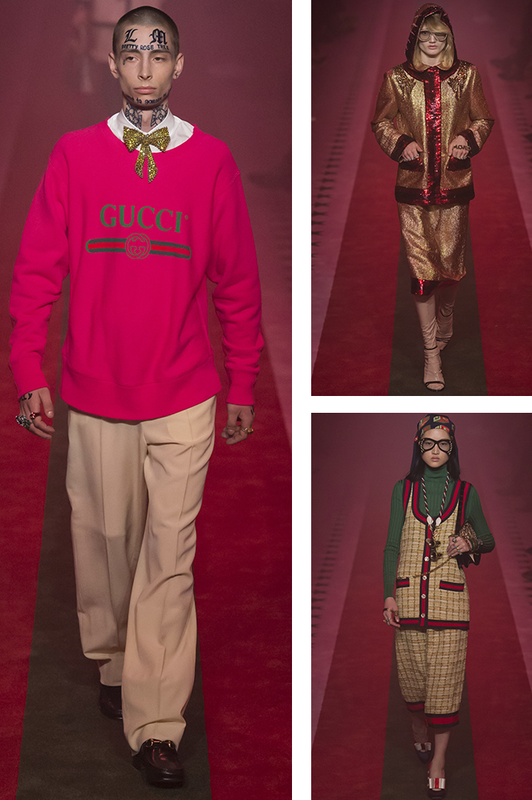 There were plenty of metallics seen throughout the collection, either part of a fringe tiered coat, a metallic hooded parka, gorgeous brocades or simply as accents, including the best gold bow pin worn between the white button down shirt underneath a hot pink Gucci sweatshirt paired with cream wide trousers + their signature loafers, worn by a perfectly inked male model. 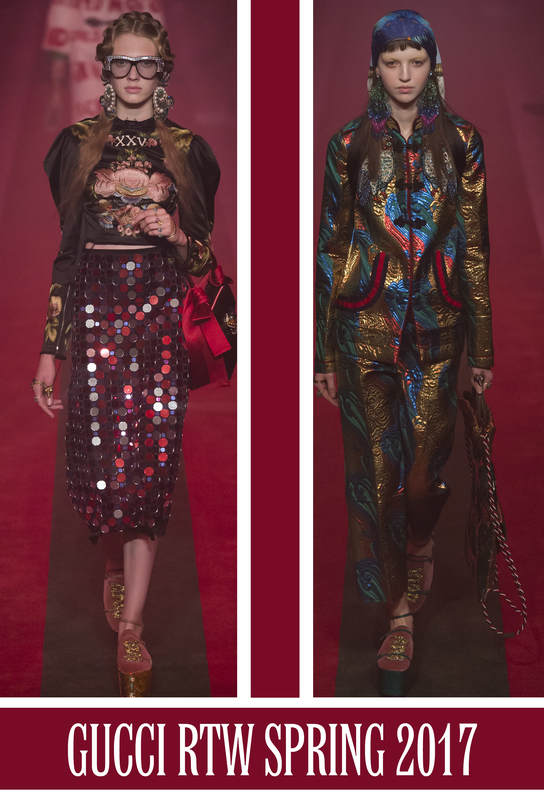 But it was great to see the mix of huge vintage hats with modern flair when mixed with patent leather platform boots, athletic style pants with a wide side stripe along with a floral jacket. Besides loafers, there were plenty of platforms seen throughout but the ones that stuck out the most were these patent 5-inch wedge with a velvet upper, in various colors, embroidered with a gold snake, said to represent a moment of Renaissance Venice. 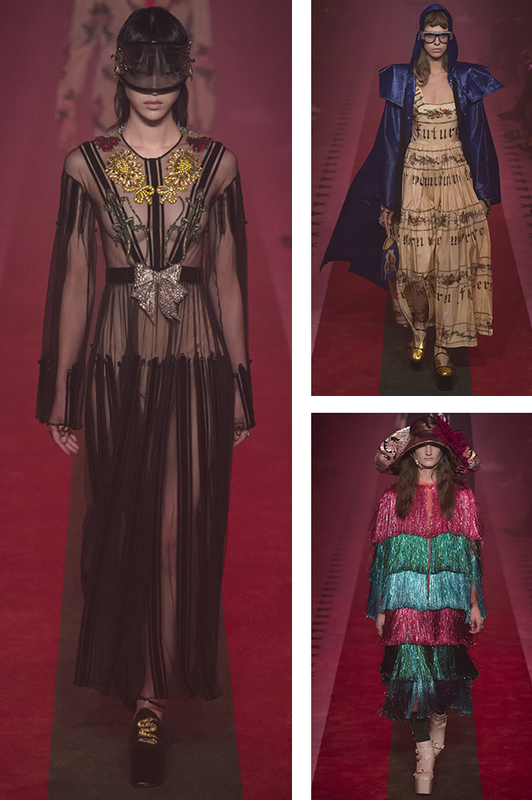 “Prostitutes in Venice used to wear these,” designer Alessandro Michele exclaimed to VOGUE RUNWAY. But what made this shoe extra special was the two-in-one shoe made extra special with the rose bud–printed insole within. “You see, there is a flat slipper inside, one you can wear separately, ”as Michele explained while dismantling the shoe. 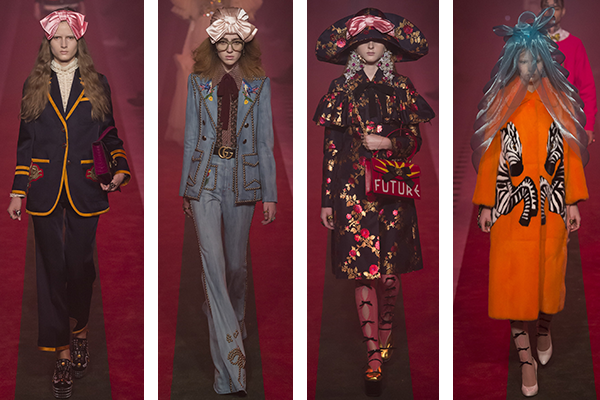 In addition to these sweet romantic details, including stockings with small bows in between peek-a-boo holes going up the front of the model’s leg when exposed, there were an enormous array of hats adding another level to the looks they accented. The collection of hats included everything from turbans to bows, fascinators + a long visor covering the whole face. 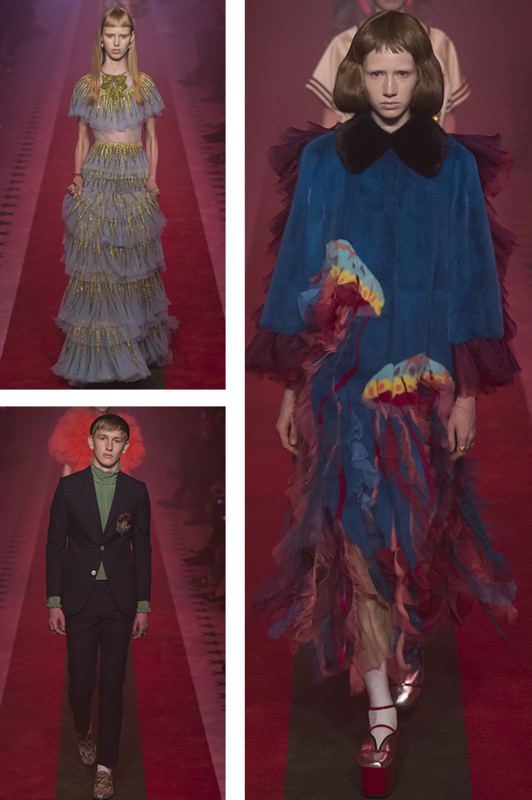 Every piece told a story but they all amounted to one of the most spectacular collections of this season only Gucci could achieve!